Maurice Dalby was born in Linton in 1896, the son of John Thomas Dalby and his wife Elizabeth. 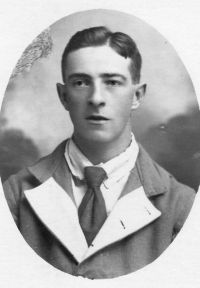 Maurice was the third Dalby brother, along with Alan and Arthur, to serve in the Army in WW1. In 1911, Alan was living with his parents and one of his brothers, Alan, at Hillside Cottage, Linton. Maurice enlisted in the Army on the 2nd November 1915 in Harrogate first as a Private in the Yorkshire Dragoons with a service number of 4062. We do not know the exact date, but at some stage of his Army career, Maurice transferred from the Yorkshire Dragoons to the York and Lancaster Regiment (Y&L). Maurice first went overseas on the 26th December 1916 when he embarked in Folkestone for service in France, disembarkinglater the same day in Boulogne, and being posted to 34 IB depot, waiting a final posting to an active battalion. This was the 8th Battalion Y&L to which he was posted on the 14th January 1917, actually joining them on the 10th February 1917. On the 7th June 1917, the 8th Battalion Y&L took part in the Battle of Messines, and on that day, Maurice was admitted to 12 Casualty Clearing Station and was transferred to 97 Field Ambulance. He was evacuated from the battlefield and on the 8th June was admitted to 16 General Hospital in Le Treport with a gun shot wound to his left wrist. His injury was serious enough that he was brought back to the UK (on the 12th June) and on the 15th was admitted to the 4th Northern General Hospital in Lincoln. Maurice's injuries took some time to heal and he spent from 29th June 1917 until the 8th September in Military Convalescent hospital, until he was deemed fit for duty and was sent back to service, joined the 3rd Battalion Y&L on the 17th September. On the 26th November, Maurice was sent to France, en route to fight in Italy with the 8th Battalion Y&L. Maurice transferred again, on the 2nd December 1917, to the 9th Battalion Y&L. On the 15th June 1917, almost exactly a year since last being wounded, Maurice was again wounded in action, this time with wounds to the right hand and left buttock. Maurice travelled by the 31st Ambulance train from Cremona to Villaverla and was in 29 General Hospital. On the 8th July he was discharged to Caesaro Camp, in Argiata and on the 26th July 1918 joined GHQ R Camp, Italy before rejoining 8 Battalion Y&L on the 21st August 1818. Maurice was promoted to Lance Corporal on the 5th November 1918, and was discharged from the Army on the 26th March 1919. After the war Maurice returned to the area and married Gladys L. Miles in 1923. In 1939, Maurice was living at 9 Bank Street, Wetherby.